Your car engine needs motor oil to work properly. Similarly, the auto transmission system needs transmission fluid to keep the various parts operating smoothly. It is this fluid that helps your gears shift. Transmission fluid may also provide hydraulic lubrication in certain vehicles with power steering systems. It is essential drivers understand the importance of automatic transmission fluid. Serious damage can occur to your transmission if the right amount of fluid is not maintained. In addition to regularly checking the fluid level, you may be alerted to the need to add fluid if you hear noise when yours gears automatically shift. In some cases, you may find that your car lurches as the gears shift. This is a good indication the transmission fluid in your car is too low. A grinding noise often occurs when there is not enough lubrication in the transmission to keep the various parts moving effortlessly. There are three main purposes of transmission fluid. As previously stated, it works as a gear lubricant in the automatic transmission. For this purpose, the fluid must maintain a certain amount of pressure since it provides a hydraulic function in the transmission system. Secondly, transmission fluid keeps the entire transmission clean as friction occurs. And it also works to cool the transmission which is the only way it will work right. Unlike motor oil, transmission fluid does not burn off so if you notice your fluid level has dropped, you can be fairly certain you have a leak. By monitoring the transmission fluid in your vehicle, you are better able to quickly fix problems like a leak so that permanent damage does not occur. Rebuilding or replacing a transmission is expensive. It is cheaper to check your transmission fluid on a regular basis. Like motor oil, transmission fluid does have to be changed. Flushing a transmission gets rid of the dirt and debris that has accumulated and hinders performance. As with most things related to car care, you have many choices when it comes to buying transmission fluid. It is critical you choose the right one for your vehicle. Never use motor oil in place of automatic transmission fluid. Your car owner's manual is a good resource you should refer to if you have questions about your automatic transmission. You can also consult a local dealership or visit an automotive parts store. They will be able to recommend the best transmission fluid for your vehicle. Any time you hear a noise or feel a change in the way your gears are shifting, you probably need to change your transmission fluid. 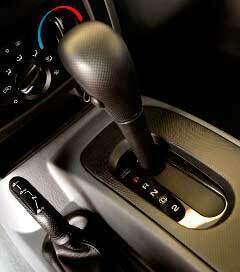 Automatic transmission fluid does not have to be changed as often as manual transmission fluid. You can drive between 60,000 and 100,000 before you need to change fluid. This does not mean you should wait that long to check it. You should check it every month. Remember, you are looking for leaks as well. You can either change the transmission fluid yourself or have it changed. Most drivers do not want to deal with the hassle of changing automatic transmission fluid so they will take it to a local dealership or repair shop to have the work done. When you do not monitor the transmission fluid in your car, you risk overheating your transmission. Depending on the extent of the damage, you may need to have your transmission completely rebuilt or have a new one installed. It makes more sense to regularly check the fluid and have it changed as recommended by your mechanic or car manufacturer.